What is That Slimy Stuff? Neoregel1a bears Its flowers In a pool of water. Some of the most curious plants I've ever come across are those which produce “water flowers”, aquatic flowers borne on non-aquatic plants. They are a paradox of the plant kingdom and a tropical speciality. Water flowers begin their lives in an aquatic environment but become aerial when they are fully open, so the contradiction is not as Alice-in-Wonderland as it first seems. 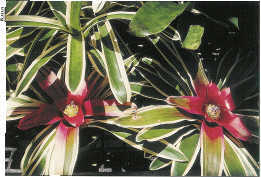 The best known water flowers are those of tank-forming bromeliads such as Neoregelia. The water held in its rosette of tightly-overlapping leaves is an aerial pond in miniature, complete with mosquito larvae and frogs. Its flowers, borne on a short stalk in the center of the rosette, are aquatic only in bud. Just before the flowers are due to open, the plant pushes them above the water line, where they open and attract pollinators. The orange bracts of this heliconia hold small white flowers ... and pond water. Heliconia have some of the most conspicuous water flowers, brightly colored and pollinated mostly by hummingbirds. The attractive parts of the heliconias, both to birds and people, are the leathery bracts that surround the flowers. The boat-shaped bracts of pink, orange, red, yellow or green spiral around the inflorescence axis or alternate on either side of the stalk, giving the inflorescence a flat, zigzag look. Some are erect; others are pendant. The bracts of erect species, such as H. bihai or H. caribaea, often hold a watery, somewhat slimy liquid. Alexander Skutch, a keen observer of tropical biology, called the liquid “disagreeably foul” and found it was filled with insect larvae. The flowers develop in this aquatic environment, breaking the surface only when they open. After pollination by hummingbirds, the flowers wither and decay in the putrid soup. The fruits, which are berries, develop while completely submerged. When the fruits are ripe, their stalks elongate and push the berries above the surface of the pool, where they can be taken by fruit-eating birds, which disperse the seeds. Where does this liquid come from and what is its function? Careful experimentation revealed that the liquid is a plant secretion, not just accumulated rain water; when bracts are emptied, they refill overnight. The pH of the liquid is slightly alkaline, which accounts for the slimy feel and could serve to discourage the formation of harmful algal or fungal growth in the bract tanks. Ravenala holds murky water in the base of its leaves. Bract fluid seems to protect the submerged and developing flowers. When biologists compared insect damage on flowers from bracts in which drains had been installed with those from undrained bracts, they found that flowers from drained bracts were much more likely to experience insect damage. They also compared the average damage to flowers of species with erect inflorescences with those of pendant inflorescences. They discovered that heliconias with erect, water-filled inflorescences suffered less herbivory to their flowers than those with pendant flower stalks. 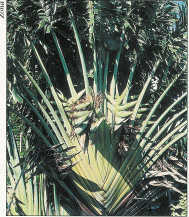 Ravenala madagascariensis, the traveler's tree, is a cousin of Heliconia and bananas. It is in the Bird-of-Paradise family, the Strelitziaceae. Its common name refers to the fabled use of the water accumulated in its fan of leaf bases. Supposedly travelers would use this water as an emergency source of drinking water, but a wayward traveler would have to be very thirsty indeed to risk drinking the water from the base of Ravenala leaves. The liquid is a microbial soup, swimming with unseen dangers. A traveler filling his canteen at a Ravenala chooses between amoebic dysentery and dehydration. So why is water stored in the leaf bases? It's surely not to infect unsuspecting travelers. Investigate the Ravenala growing next to the entrance of the Garden Shop, and you can see for yourself how the stored water is used. The plant sends short roots out from the stem and into the leaf base reservoir. The extra water helps Ravenala survive the dry season in its native Madagascar. The strange flower of Coryanthes, the bucket orchid. Bees fall into the bucket formed by the lip (arrow at right) and escape drowning through the passage below the column (arrow at left). Paired, horn-shaped glands at the base of the column secrete liquid to fill the bucket. Ravenala also secretes a mucous, brownish fluid in the boat-shaped bracts of its inflorescences, just as its cousins the heliconias do. While collecting flowers from Ravenala, I found out for myself just how gooey the fluid is. I can attest that it's smelly and none too pleasant. As far as I know, the fluid of Ravenala has not been chemically analyzed, nor has its function been experimentally investigated, but I would be willing to bet that the liquid has a protective function just as it does in Heliconia. The high viscosity of the mucus-like slime may slow evaporation in the dry natural environment of Ravenala. One group of plants, the bucket orchids, uses water to its advantage in a most unusual way. Flowers of the genus Coryanthes secrete a liquid that collects in the flower and plays a critical role in the pollination by bees. Coryanthes has the most morphologically complex flowers in the Orchid family. Like all orchids, they have three sepals and three petals, one of which is modified into a bucket-shaped lip, giving these orchids their common name. The pendulous flower is held with its lip lower-most. Two glands on either side of the column (the fused stamens and pistil) secrete a fluid, drop by drop, into the lip's cup. The rim of the lip is shiny and waxy and secretes a perfume that attracts Euglossine bees. When a bee lands on the rim of the lip and begins to investigate the intoxicating aroma, it slips into the “bucket” and becomes so water-logged that it cannot fly out. The only way out of the lip's watery trap is through a nearly tubular, spout-like opening at the opposite side of the cup just beneath the column. The spout has a sculptured inner surface, the only surface on which the bee's feet can gain a purchase. As the wet and confused bee climbs through the spout, it touches first the stigma then the anthers, where it collects pollen, which in orchids is not in grains but rather in waxy packets called pollinia. The Coryanthes flower is not pollinated unless the visiting bee is carrying pollinia acquired from a previous encounter with a Coryanthes. These orchids rely on the bees’ inability to resist the perfumes of their flowers. Each of the 20 or so species of Coryanthes produces a unique fragrance, and each fragrance attracts a particular species of Euglossine bee. Bees must be exactly the right size for pollination to occur. A larger bee could crawl or fly out of the watery trap, and a smaller bee (if it didn't drown first) might crawl through the spout without catching the pollinia. These orchids are utterly dependent on clumsy, gullible, weak-willed bees for their reproduction and survival. If the bees ever wise up, if they ever catch on to this wet practical joke, Coryanthes is doomed.